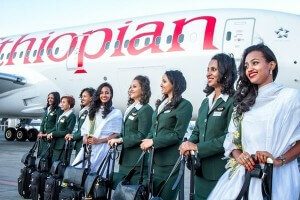 Ethiopian airlines operated an All-Women Functioned Flight today on the Addis Ababa – Bangkok route. In all its 70 years of service the airlines has dispatched it first ever flight operated by female crew from the flight deck, to the pilots and all crew members and even the on ground flight preparations conducted by women. The airline says it wants to promote women’s empowerment and encourage more African girls to pursue aviation careers. The airline adds that 30 percent of its employees are women but the number of women in positions such as pilots and technicians is way smaller. Ethiopia airlines hopes that by creating the opportunity and providing inspiration for young African female students to believe, dream and work towards filling the skill gap in the aviation industry.